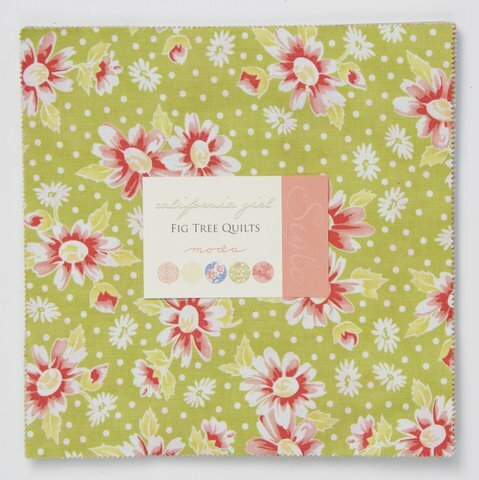 This month I will be giving one lucky blogger the opportunity to win a California Girl Layer Cake by Fig Tree Quilts. The person with the correct answers will win. Competition Closes 31st December 2011. Good Luck. Well, this is a stab in the dark, since I only just started reading your blog a couple weeks ago. I'm going to guess Chocolate, France and Turquoise. I'm going to guess "Camembert", "France" and "Turquoise" …. with fingers and toes crossed ;o). I am going chocolate, turkey and turquoise! I was going to guess like the other comments, so I'll guess C,B and B.
Oh dear, me too, I was going to say Chocolate, France and Turquoise, but a layer cake isn't going to split three ways very easily, so I'll change it to Camembert cheese, Turkey and Red. hmmm, I will guess chocolate, France and red! California Girl is THE fabric I have been waiting for!!!! I'm guessing chocolate, France and turquoise as well. Decided that before I read the first two comments. Great minds might be wrong but we think alike! Chocolate, France and Turqoise…just a guess. Thanks for the chance. I am guessing C B and B! thanks! Chocolate, France and red would be my picks. Thanks for a chance – I'd love to try using a layer cake. I will guess Tomatoes, Greenland, Turquoise. Hm, well seeing as my original answer is already taken at least twice, I'll go chocolate, Turkey, turquoise. Camembert Cheese. france and red, i hope! love fig tree … thanx for the opporunity to win some. How about Camembert Cheese, France, and Red. Although you might like Greenland and Turkey I somehow don't think they are favs. Oh this is fun! I`ll go with camembert, France and turquoise! Thanks for a lovely giveaway. That's an easy one- chocolate, France, turquoise! I think I will go chocolate, greenland, orange. Chocolate, France and Turquoise…. haha… so many of us think the same!!! I'll take a shot in the dark………. Camenbert cheese, France and turquoise! Camembert Cheese, France and Turquoise. I'll go for: chocolate, France and Turquoise. Have a lovely day!! Cam Cheese, Turkey and Orange! Trying to pick different answers to what has already been said! My guess is Camembert Cheese, France and Red … Thanks for the chance! I think the answers are – Camembert cheese, France and Turquoise! I'LL GUESS: CHOCOLATE,FRANCE AND TURQOISE! Chocolate, France, Red???? Any of them sound good to me! Just a guess… Cam cheese, France and turquoise. Oooh great theme for a giveaway! Lovely fabric! I'll guess chocolate, France and turquoise too because they are what I would choose. Totally guessing here Chocolate (who's isn't) Turkey and Turquoise only because I have seen lots of it on your blog. I'd say Chocolate, France and Turquoise. PS France is great except for the French! Well, who doenst love Chocolate, France for all things cultured and wonderful, and turquoise since its all over your blog header… Thanks for the chance, love that fabric and too poor go go buy any. I would have to say your favourite food is Camembert cheese, favourite country France and favourite colour Turquoise. hmm…chocolate, france and turquoise would be my guess. I am presuming when you say "my" you are speaking about yourself. "What is my favourite food, foreign country and colour?" I think Camembert Cheese, France, Turquoise – these would be my choices and I'm hoping your blog header gives it away a little. I've been following for a while, but this is still a guess! My guess is Chocolate, France, and Turquoise. Thanks! Where's the crib notes, the cheat sheet. I don't think I studied the right material, can I have a takeover? OK I'll use the pin method. Camembert cheese, France and red. Don't I get a point for trying? Have a Merry month. Thanks. I was thinking that both red and turquoise were your favorite colors. I've waited for weeks to enter because just couldn't make up my mind and didn't know what to say. It didn't improve with age! Thanks for the chance. I am going to guess chocolate, France and turquoise. I would say….. Chocolate, France and Turquoise.. I'm guessing camembert, France and turquoise. Thanks for the chance to win a great fabric line. okay.. Chocolate, Greenland and Turquoise…. France is so "old Hat"! I may be too late as it's already New Year's Eve here in the UK! Thanks for the glorious giveaway!